How do I upload workouts from my product to RUNSENSE View? You can upload workouts through Epson Run Connect on your mobile device or your computer (Windows only). See the instructions below. 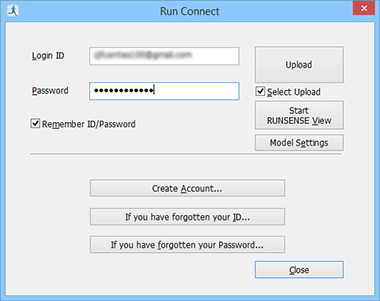 Note: When uploading several hours’ worth of data, it is best to use your computer (Windows only) to upload data to the RUNSENSE View web application. Uploading a large amount of data through the Epson Run Connect app can take a long time. However, if you have a Mac, you cannot use the Epson Run Connect software. You must install and use the Epson Run Connect app on your mobile device. Press and hold the product’s D button on the time screen. Tap OK on your mobile device. Note: Tap Get Next Data if the button is available and you don’t see the workout you want to upload, then tap OK. Get Next Data appears only when a large number of workouts are recorded on the product. Tap the workout you want to upload, then tap Upload. Tap OK on your mobile device again. Press the product’s A button to end communication with the mobile device. When the upload is finished, the Workout Details page appears. Connect the charging cradle to your computer. Make sure Epson Run Connect is installed on the computer. Place the product in the charging cradle. You see the Run Connect screen on your computer. If you want to upload all workouts recorded on the product, make sure the Select Upload checkbox is not selected and click Upload. If you want to upload only some of the workouts, select the Select Upload checkbox and click Upload. You see the Wrist Device Data List screen. Select the checkbox next to each workout you want to upload and click Upload. Then click Yes. Run Connect uploads the workouts to RUNSENSE View. When the upload is finished, RUNSENSE View starts.